Info: Created on 13th November 2014 . Last edited on 21st November 2014. Great concept, execution and sample. It should be lots of fun to play this game, leaping from letter to letter and trying to read them at the same time to discover upcoming missions. Good luck! I like it, you know... But this is my first choice to win, too! Congratulations! FontStruct Staff have deemed your FontStruction worthy of special mention. 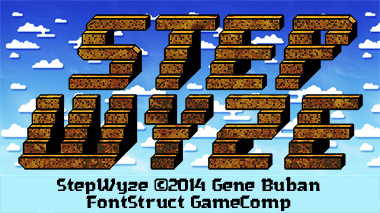 “Stepwyze” is now a current Featured FontStruction. Congratulations! FontStruct Staff have deemed your FontStruction worthy of special mention. “Stepwyze” is now a Top Pick. Congrats, dear master! Great font and great and surprising game samples too! Congratulations on a worthy success. Hope the game goes well. I warned you about those stairs bro? It's an amazing font. I just downloaded it. So many thanks!! I have a Microsoft computer. I like this but why are there no lowercases? Does this work in html/css ?